Suffolk University, like its home city of Boston, is alive with intellectual and cultural vigor. 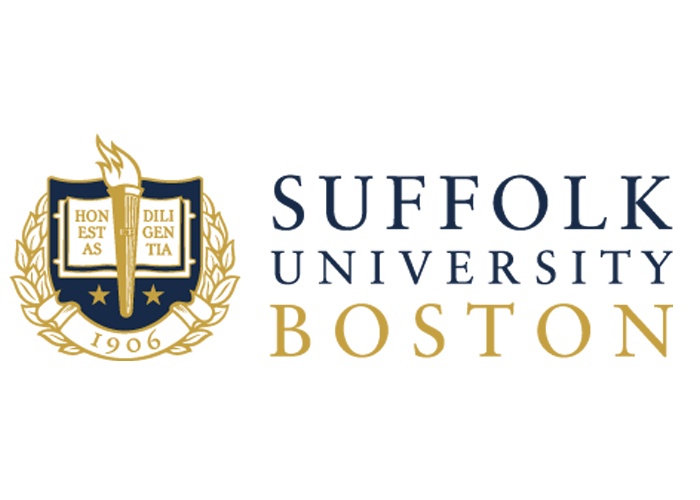 Founded in 1906, Suffolk is a private, coeducational, fully accredited university offering undergraduate and graduate degrees in the College of Arts and Sciences, Sawyer Business School and Law School. The University also maintains a campus housing various undergraduate programs in Madrid, Spain. We take pride in being a personal, student-centered school, where faculty and administrators know students by name. There are 90+ academic programs for undergraduate and graduate study which emphasize quality teaching, small class size and real-world career applications. Class sizes are small in the undergraduate programs averaging 20 students. Our location in the heart of Boston provides our students with outstanding internships or part-time work that help support their academic goals as they move forward into a professional career. A diverse population of 5030 undergraduate students, 1106 graduate students, 1065 Law School students, from 34 U.S. states and 100 different countries. 20% of last year’s incoming new undergraduate class was comprised of international students. Suffolk has expanded its founding vision of opportunity to a global stage. Suffolk University is accredited by the New England Association of Schools and Colleges. The Sawyer Business School holds AACSB International—The Association to Advance Collegiate Schools of Business accreditation. The University holds many other program and specialized accreditations as well.